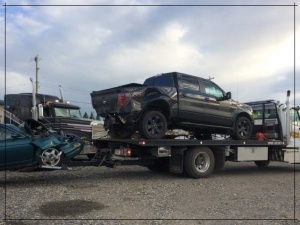 Haulers and Towing Vehicles | Res-Q Towing 24 Hour Emergency Roadside | Didsbury Towing | Full Service AMA Towing in central Alberta. Serving Mountain View County Since 1988! 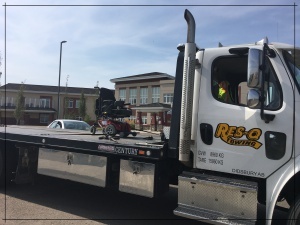 Located in Didsbury, Alberta, Res-Q Towing has a variety of towing vehicles, including trucks that can handle towing heavy duty cargo. These three trucks, two low profile and one 22 foot, handle the majority of our calls from towing, fuel delivery, boosting, tire changes, door unlocks, and winches. Our two low profiles are great for vehicles with all the ground effects packages. Together, these three trucks can handle all vehicles up to and including empty one-tons as well as your motorcycles, quads, and skidoos. All our trucks operate locally or long distance. We have a Gooseneck that handles multiples, small bobcats, small trailers, and two cars at one time. Our Tandem Tilt Deck truck takes over where the smaller trucks leave off. Our tandem transports medium duty loads from service trucks to small grain trucks, small buses to ambulances. It also helps with some farm and acreage equipment to construction equipment. It is also capable of hauling your RVs, motorhomes, campers, and trailers. 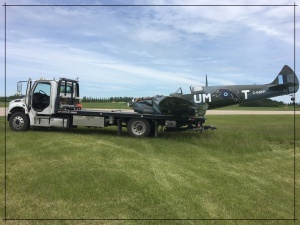 If you need your tool trailer, storage trailer, office trailer or small shed moved from the job site, we can do that too. We can also move your garden sheds, tool sheds, and small workshops. Some sheds may require pilot cars and permits, depending on the size. Need your holiday trailer, 5th wheel, gooseneck, or bumper hitch trailer moved? Whether local or long distance, our one ton Dodge has that capability. CHEAP TOWING ISN'T NECESSARILY GOOD. GOOD TOWING ISN'T NECESSARILY CHEAP.